Begin each day in an idyllic setting with stunning panoramic views of the Green Mountains and terrain. Crisanver House, a charming true country hideaway embraces a relaxed lifestyle and soothing refuge in the heart of the Green Mountains. Our Green Mountains Inn is a 200 year old farmhouse and has been thoroughly reconstructed to modern standards while preserving its classic features. Fully refurbished guestrooms focus on detail with upscale touches, highlighting artwork and antiques to evoke a sense of elegant comfort. 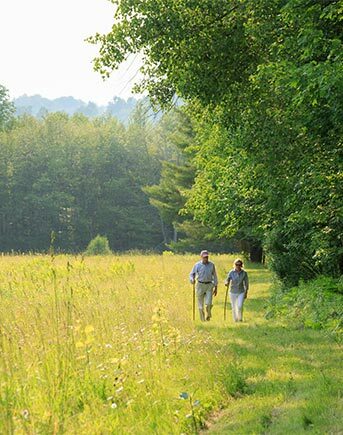 Situated high on a hill amidst 120 acres of landscaping, gardens, and woodlands complete with on site swimming pool & pool-house, walking trails, tennis, shuffleboard and bocce for an unforgettable retreat or a magical Vermont barn wedding. Within a convenient drive, explore Vermont’s well known micro brewery trail and craft cheese trail. Find an adventure on land or lake with golf (5 courses), hiking, horseback riding, canoeing, museums, antiquing, quaint villages, sightseeing and great shopping. Delectable dining in our conservatory prepared with the freshest locally sourced and organic ingredients enhances the ambiance. So enjoy quintessential Vermont focusing surroundings and the rich and immersive experience of the best of the Green Mountains.